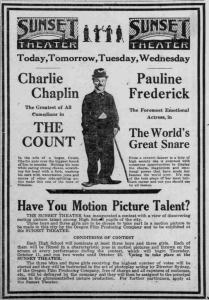 In these two separate advertisements located next to each other in The Plaindealer’s July 6th, 1905 paper, The Roseburg Theater boasts two shows on the same days: Friday and Saturday, July 7th and 8th. 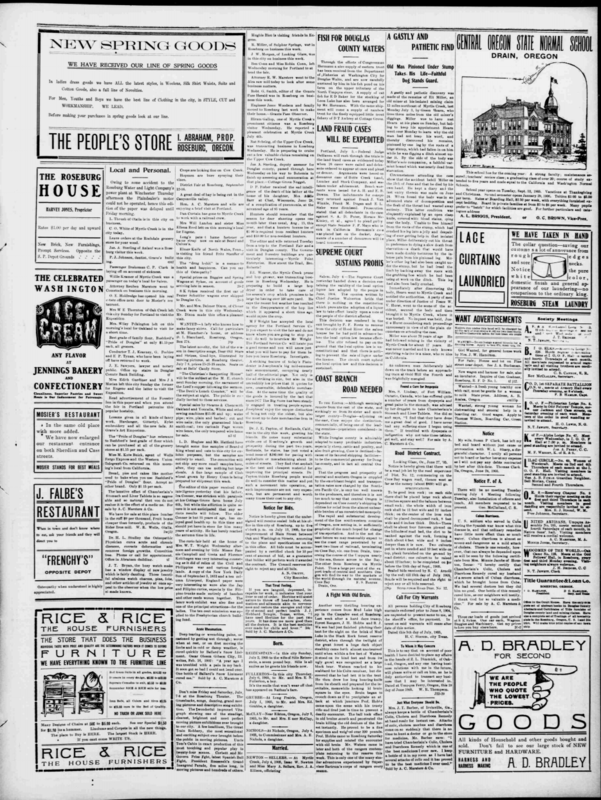 The first advertisement in the paper details the showing of “the latest novelty” Dear Old Stars and Stripes, Goodbye which has prices ranging from 15-25-35 cents. Tickets are available at Bells’ Candy Store, which indicates this showing may be a more family-friendly event than the other advertisement located further down the page. The sale location for tickets indicates there was an intention to attract a younger audience. The following advertisement differs greatly from the first, despite being placed by the same theater and showing on the same day. “The Groesbacks” are slated to perform in a separate exhibition from the films showing the same day. This advertisement uses an interesting promotional strategy of boasting the technology used to show the moving pictures the Vitagraph showing “…one of the steadiest, clearest, brightest and most perfect moving picture exhibitions ever brought to our city”. This emphasis on clarity of the films and equipment is similar to exhibition practices of today, in which audiences want to see the best, brightest, and clearest films (such as IMAX, 3D, etc). 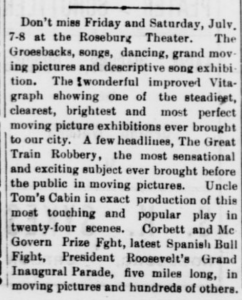 Headlines in this advertisement include The Great Train Robbery, Uncle Tom’s Cabin, Corbett and McGovern Prize Fight, the latest Spanish Bull Fight, as well as President Roosevelt’s Grand Inaugural Parade. The advertisement states that the film Uncle Tom’s Cabin includes twenty-four scenes, indicating the number of scenes was more than average for the era, proving to be a major selling point. Further research shows the Uncle Tom’s Cabin was directed by Edwin S. Porter under Thomas Edison and released in 1903; the same year as his film The Great Train Robbery. Uncle Tom’s Cabin included various racist and problematic depictions of slavery and slave auctions, with white actors performing in blackface. The film is also known as Slavery Days and has been preserved by the University of Virginia Department of English (Railton). Further research could help to decipher who or what “The Groesbacks” are. 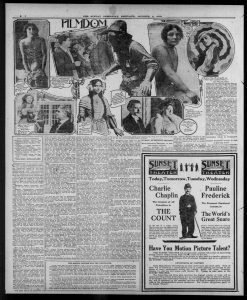 It seems as if they were traveling entertainers, similar to a modern band, but extensive research in various newspapers across Oregon would be required to discover their identity and touring history. Railton, Stephen. “Uncle Toms Cabin & American Culture a Multimedia Archive -University of Virginia Department of English.” Edison/Porter 1903 Film, The University of Virgina/National Endowment for the Humanities, 1998, utc.iath.virginia.edu/onstage/films/mv03hp.html. The Roseburg Theater. “The Plaindealer.” The Plaindealer [Roseburg], 6 July 1905. 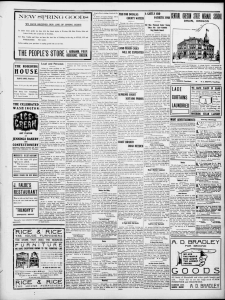 As I continue to do research on theatres in La Grande, Oregon from 1914-1921, I ran across an article in the La Grande Evening Observer which states that in the spring of 1916, the Arcade Theatre was going to remodel. The news came from the newest manager of the Arcade Theatre, Mrs. H. B. Leiter. So far this is also the only theatre I have come across with a female manager. Mrs. Leiter was going to remove the vaudeville shows entirely from the theatre. She claims that the movies are becoming higher in quality, and that is what audiences really want to watch, not vaudeville. Mrs. Leiter also reminds the readers/audience that they are seeing the same quality pictures for 10 cents, that others are seeing in Portland for 15 cents, as a way to entice them to continue coming to the Arcade. I have no real explanation as to why Mrs. Leiter would remove vaudeville from the theatre, except that around that time, there were traveling movie showings. Calvin Pryluck talks more about these traveling movie showings, explaining that they had a circuit they would travel, stopping in towns large and small, and showing their movies. While Pryluck couldn’t find evidence, there are stories of some of these itinerant movie showings traveling around Eastern Oregon up until the 1950’s. For Mrs. Leiter, these itinerant movies could have been a problem for her business if they were able to show a wider variety of movies, while she was showing vaudeville and movies. The second article, which was found directly underneath the first, talks about how Mrs. Leiter is also going to redecorate the theatre to make it new and attractive. She states that she wants everyone to feel at home while at the Arcade, as well as how well taken care of the children will be, especially since from time to time, the Arcade will play specific movies directed towards the children. The remodel, as well as the language directed at the family, could possibly be another way in which Mrs. Leiter is competing against the itinerant shows. While we may never know exactly why Mrs. Leiter was remodeling the theatre and removing vaudeville shows, she was at least making her mark on the Arcade Theatre. Advertisement for ‘The Best Our Ambition’. 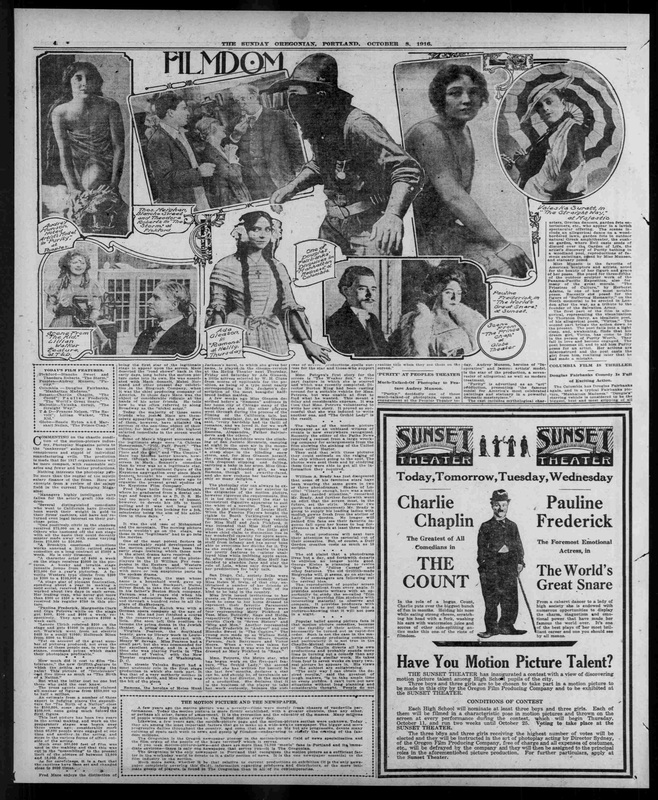 Weekly Chemawa American, 14 July 1911. 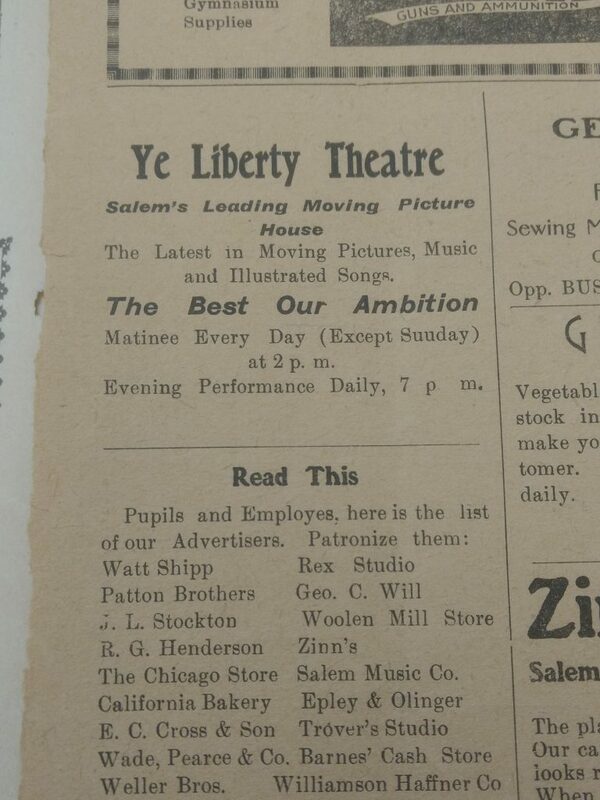 Above is an advertisement for the program ‘The Best Our Ambition’ at the Ye Liberty Theatre in Salem, Oregon. This advertisement was found in the Weekly Chemawa American newspaper which was published by the Salem Indian Training School on July 14, 1911. This advertisement was placed within a page full of various other advertisements. It is likely the school was trying to compress all the advertisements onto a single page, therefore this advertisement was not a central focal point. 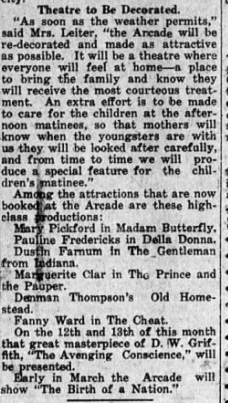 The advertisement states there is “matinee everyday except for Sunday,” and there are “daily evening performances.” The advertisement did not list a price for the showing, which is quite unusual when comparing it to various other advertisements; (and I doubt the theater was free). Placing the price on the advertisement would have been helpful. The fact the advertisement is within the Chemawa Boarding School newspaper is interesting. This means the theater wants students from this area to attend the theater. I do find the this odd considering the students had to pay to leave the school, and then potentially pay again to see a program. These are young students, and it is likely this would not have been feasible. It may be more likely the theater wanted to reach the employees, not the students. Or perhaps the theater was very interested in having a younger audience. Looking at historical context, the use of this advertisement could be a way to further assimilate the Indigenous children attending the boarding school. Boarding schools have a history of wanting to strip Indigenous children of their language, traditions, culture, and identities. Films have the ability to influence individuals. It could be seen as a tool to illustrate a ‘normal’ American life to children they are trying to make more ‘American’.